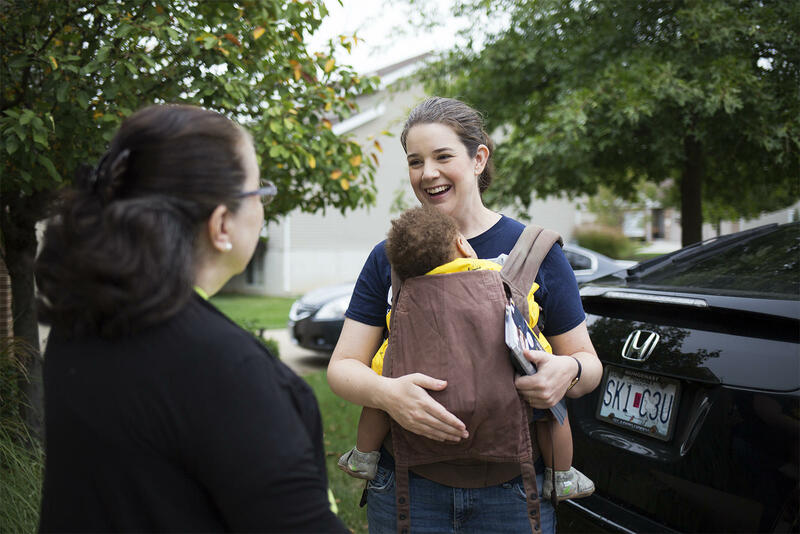 Mary Elizabeth Coleman plans her route for canvassing while holding her son Gerhardt. Coleman is part of a historic surge in female candidates across the country and here in Missouri. This year 103 women are on Missouri's November ballot. This is the beginning of a long day for Coleman, who’s part of a historic surge in women running in Missouri and across the country. 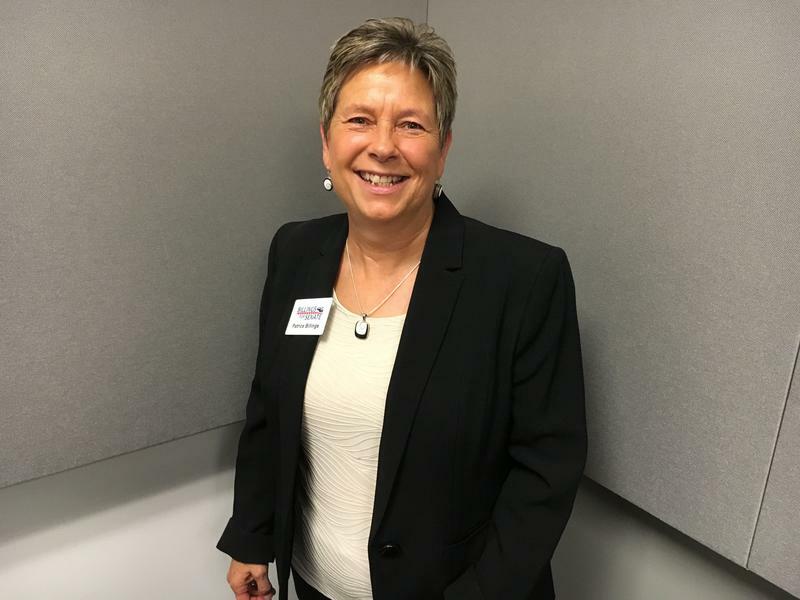 She’s running as a Republican in Missouri’s 97th House District in Jefferson County. The number of women on the state ballot in November has nearly doubled since 2016. This year, a record 103 women are running for federal and state office. Hear about the record number of women running for office in Missouri this November. For the last two years, the number of women represented in Missouri’s General Assembly has dipped to 23.4 percent, below the national average of 24.9 percent. Currently, women hold 46 of Missouri’s 197 legislative seats. Patrice Billings is a Democratic State Senate in Missouri's historically deep-red second district. She's running against a Republican incumbent and she considers herself part of the so-called "blue wave" of candidates motivated to run by the President and 2016 election. Women have occupied about 20 percent of the Missouri legislature for the last 20 years, according to the Center for American Women and Politics at Rutgers University. From 1980 to 1990 the percentage of women in the Missouri General Assembly grew from roughly 11 percent to 15 percent. And, since the last national surge of women candidates in 1992, the percentage of women representing Missourians at the Capitol has grown by fewer than 5 percentage points. The main reason women hold only a fraction of the statehouse in Missouri and all over the United States is because fewer women run for office compared to men, said Richard Fox a professor of political science at Loyola Marymount University in California. “The pool is smaller,” Fox said. “The answer to the question, ‘how are we going to have more women in office?’ has a pretty simple answer as the first step — have more women run,” Jones said. But, it’s more difficult to get a woman to run for office than it is for a man, Fox said. The two major factors that predict whether a woman will run for office are “they’ve been recruited or encouraged across their life, at least by somebody important. And secondly, they feel equally qualified as their male counterparts,” said Fox who co-authored a report that surveyed women on the issue. 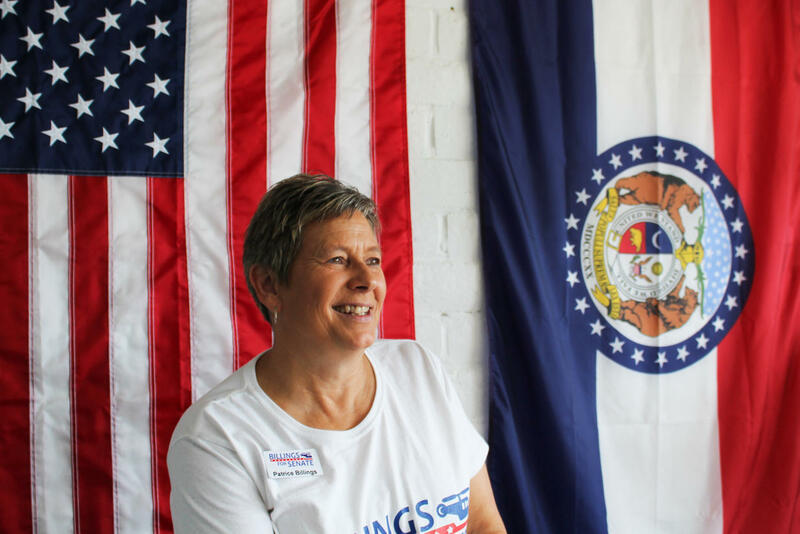 Being recruited is the reason Patrice Billings is on the ballot for Missouri’s Second Senate district in November. She’s running against Republican incumbent Bob Onder in the historically deep-red St. Charles County district. Billings, a retired police helicopter pilot, explained if she hadn’t been recruited by a county councilwoman she wouldn’t have run. 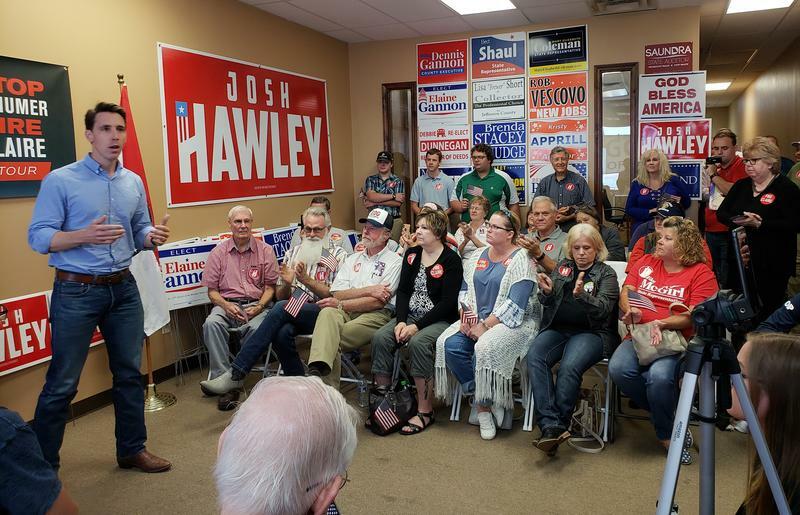 “Over the course of my life I had had different people, I thought jokingly, ask me to run or tell me that I would be a good candidate for an office at any level. And, I just discounted that, out of hand, because politics didn’t interest me per se,” she said. Once past the initial hurdle of becoming a candidate in the first place, Fox says women generally aren’t motivated to run for office by issues, but rather experiences. And this year, two experiences in particular have compelled the wave of women candidates to run for office: the 2016 election and President Donald Trump. 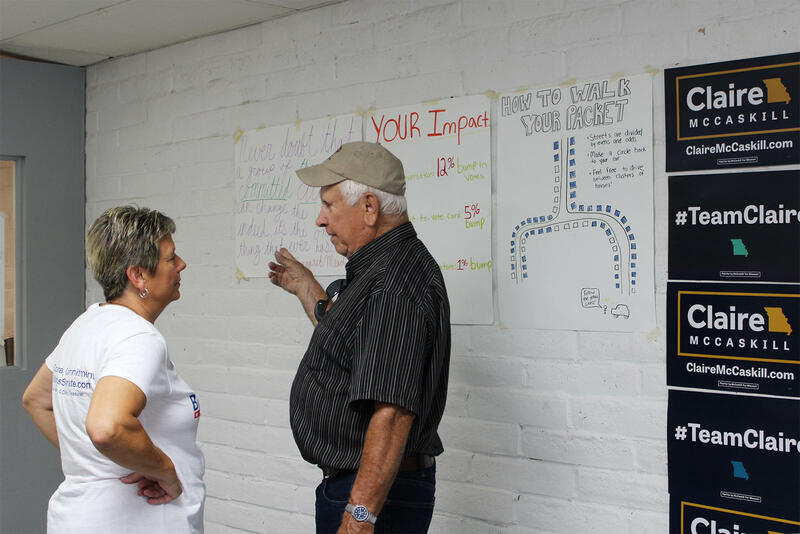 Patrice Billings listens to a prospective voter in the coordinated campaign office before heading out to canvass. “The 2016 election was a real gut-check for a group of progressive women,” Fox said. 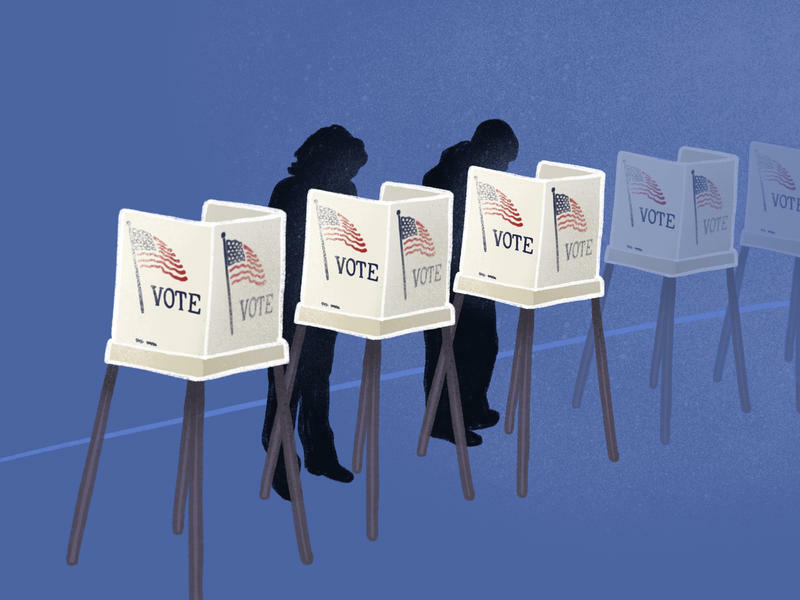 Data on women running in this election from the Center for American Women and Politics shows that about 70 percent of candidates for state legislatures across the country are Democrats and about 29 percent are Republican. Those numbers hold true in Missouri as well where 71 of the candidates are Democrats and 32 are Republicans. Within the larger group of Democratic women, many are liberal and progressive candidates who were specifically incensed by Trump and the 2016 election, Fox said. But, while the election may be motivating Democratic women to run in droves in 2018’s midterms, that doesn’t translate across the aisle says Fox. In the late '70s and early '80s Democrats and Republicans were putting forward a similar number of candidates, but “now, we have one party making progress and the other is not,” said Fox. That’s where Coleman’s campaign and candidacy is a departure from the larger trend in women running this year. Coleman is not part of that Democratic wave. She’s running as a social conservative in a swing district that straddles St. Louis and Jefferson counties. But, Coleman’s campaign is also evidence of a broken barrier for women in Missouri, said Jones, a retired University of Missouri St. Louis political science professor. Coleman, a lawyer and mother of six who’s integrated her family into the campaign, says she’s noticed an attitude shift on the campaign trail. Mary Elizabeth Coleman holds her son Gerhardt while talking to voters and knocking doors in her district. Coleman, a lawyer and mother of six, has made her family a big part of her campaign. Both Billings and Coleman represent unique groups in this year’s wave of women that separate them from the last group of women candidates in 1992. But, what makes them most emblematic of the “Year of the Woman” is they’re part of the larger group. With a larger pool of women running, there’s a greater chance that more women will be elected. Which means even if only some of the 103 women win, the needle that’s been stuck for nearly two decades in Missouri could move.